We’d love your help. 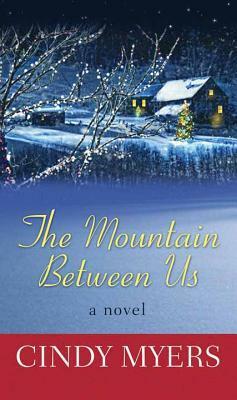 Let us know what’s wrong with this preview of The Mountain Between Us by Cindy Myers. Cut off from the outside world by a blanket of snow, the holidays are usually a time for peace and quiet in tiny Eureka, Colorado. But this year the mountain town is in trouble. Thanks to a corrupt investor, the treasury is bankrupt, leaving residents to struggle through an especially harsh winter. 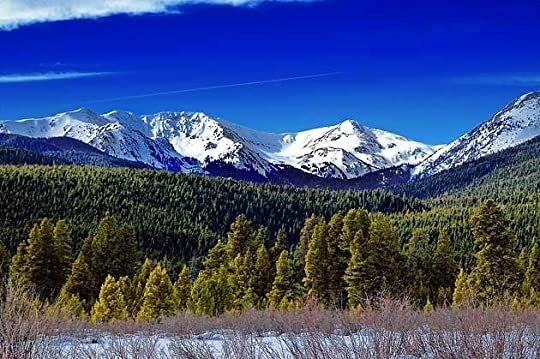 Then there are those with more personal problems, like Maggie Stevens, preg Cut off from the outside world by a blanket of snow, the holidays are usually a time for peace and quiet in tiny Eureka, Colorado. But this year the mountain town is in trouble. Thanks to a corrupt investor, the treasury is bankrupt, leaving residents to struggle through an especially harsh winter. Then there are those with more personal problems, like Maggie Stevens, pregnant and torn between single motherhood or drawing the father-to-be into a life he's not cut out for. And Olivia Theriot, the mayor's prodigal daughter, is harboring a secret so painful she may never be able to settle down. But mother nature is about to put things in perspective. . .
To ask other readers questions about The Mountain Between Us, please sign up. I was excited to be picked to read this book because I have read the other two related stories and love the locale and the characters. This is the continuing story about Maggie and she was only going to stay a week to settle her father's possessions after he died but she ended up staying. Now she is in love with Jameco Clark who's back from the war and runs the local saloon/ski instructor in season and rides a motorcycle. Maggie Stevens is terrified to tell him about the baby she is carrying, it is his but she's almost 40 and feels it's too late to start a family. The book also follows Lucas, Olivia's son likes to do things with DJ and Olivia likes DJ but doesn't want him to know. Another character is Cassie who runs the library and the annual Founder's Day pageant the telling of the town's history and she wants shelves for the library. Christmas events are just awesome, so caring and warm the feels leaves me with. Love that this book is happening at the same time as The Room at the Inn by the same author. A snowy Christmas romance! The Mountain Between Us is set in Colorado, in a tiny town where everyone leans on each other. The dynamics among the residents of Eureka remind me of those in Robyn Carr's Virgin River -- a focus on family, with woodsy, macho men who protect strong and emotional women. Cindy Meyers gives us DJ and Olivia, a former couple who may or may not get back together; and Maggie and Jameso, a newish couple who have some real obstacles to overcome. Throw in a few spinsters, a co A snowy Christmas romance! The Mountain Between Us is set in Colorado, in a tiny town where everyone leans on each other. The dynamics among the residents of Eureka remind me of those in Robyn Carr's Virgin River -- a focus on family, with woodsy, macho men who protect strong and emotional women. Cindy Meyers gives us DJ and Olivia, a former couple who may or may not get back together; and Maggie and Jameso, a newish couple who have some real obstacles to overcome. Throw in a few spinsters, a con artist, a teenager and a local diner, and you have yourself a town. I liked how Meyers gave the characters strength and integrity. They were likable and sweet. They held each other up during snowstorms and swindles. They lent each other an ear and a shoulder to cry on. I also liked the dual romance... and the inclusion of extended family. I felt like I could depend on these people. I trusted them. The only thing that disappointed me about this book was the rambling writing. Some chapters took way too long to say what they needed to say. A good 10% of the verbiage should have been cut to tighten up the writing. Because of the long-windedness (especially in the first half), I found myself skipping over entire paragraphs, itching to get to the action! Nevertheless, the writing is excellent and the dialogue flowed naturally. The Mountain Between Us is a warm Christmas romance, replete with snowstorms, love, and a strong sense of family. Read it beside your Christmas tree with a cup of hot cocoa, and you might even hear the jingle bells. I really enjoyed the first book of the series, so I was excited & anxious to read this second book of the series. I do not take any pleasure in this, but out of 178 books that I have read this year, this book may be at the bottom of the barrel. My first thought after finishing the book, is that the author must really hate women after portraying so many of them as man-hating psychopaths. And not one, but two of the female characters main reason for living was to hold a grudge against a man .. I really enjoyed the first book of the series, so I was excited & anxious to read this second book of the series. I do not take any pleasure in this, but out of 178 books that I have read this year, this book may be at the bottom of the barrel. My first thought after finishing the book, is that the author must really hate women after portraying so many of them as man-hating psychopaths. And not one, but two of the female characters main reason for living was to hold a grudge against a man ....for NOT reading her mind. We are not talking about a couple of tweens who may be excused for being a little emotionally immature, but grown up women who were acting like tweens. Had trouble keeping up with the characters. Or maybe it didn't keep my interest. Was getting the two guys and their girlfriends confused. And I could not imagine being that cold on Christmas Eve. That would be brutal. Book was wellwritten, but need a couple paragraph put into place to make the bookkeeper to follow. Plot is excellent. Actually a pretty sweet little book. I was drawn to this book because I love this part of Colorado. Even though I usually don't care very much for romantic novels, I enjoyed the time I spent in Eureka, Colorado at Christmas via this book. The mountains are calling and I must go. - John Muir. I became a fan of Cindy Myers when I read THE VIEW FROM HERE, the book preceding THE MOUNTAIN BETWEEN US. In fact, I remember reading THE VIEW FROM HERE during the Scouts' overnight encampment aboard the USS Missouri. I stayed up all night, in my sailor bunk, reading it with a flashlight. Myers drew me into Eureka, Colorado and I didn't want to leave. I was happy to rejoin the gang in Eureka with THE MOUNTAIN BETWEEN US. No sooner does Maggie The mountains are calling and I must go. - John Muir. I became a fan of Cindy Myers when I read THE VIEW FROM HERE, the book preceding THE MOUNTAIN BETWEEN US. In fact, I remember reading THE VIEW FROM HERE during the Scouts' overnight encampment aboard the USS Missouri. I stayed up all night, in my sailor bunk, reading it with a flashlight. Myers drew me into Eureka, Colorado and I didn't want to leave. I was happy to rejoin the gang in Eureka with THE MOUNTAIN BETWEEN US. No sooner does Maggie settle into her new home, job, and even romance in Eureka that she finds out she is pregnant. She is unsure how Jameso - Iraq veteran turned ski instructor - will feel about pending fatherhood. Can he strap a baby seat onto the back of his vintage motorcycle? Meanwhile, the other residents face challenges with their families as the impeding winter season approaches. Myers delivers another engrossing story of a small town with quirky characters. It is a quiet story whose action mosey alongs, enabling the reader to reflect upon the families who are as different as they are the same. Recommended for those readers who appreciate contemporary fiction layered with subtle conflict and light romance. I received this book from Netgalley.com in exchange for my honest review. Thank you to netgalley.com, to Kensington Books, and to Cindy Myers. This was a very sweet, romantic story with a Christmastime setting. I enjoyed the story but it wasn't exactly what I was expecting. The summary spoke of missing and stranded townspeople so I was expecting a little bit more adventure and danger surrounding the blizzard that blew into town. The characters lacked development in my opinion. Their emot I received this book from Netgalley.com in exchange for my honest review. Thank you to netgalley.com, to Kensington Books, and to Cindy Myers. This was a very sweet, romantic story with a Christmastime setting. I enjoyed the story but it wasn't exactly what I was expecting. The summary spoke of missing and stranded townspeople so I was expecting a little bit more adventure and danger surrounding the blizzard that blew into town. The characters lacked development in my opinion. Their emotions seemed only surface deep. Additionally, when reading the dialog of the men, I could tell the story was written by a woman. The conversations between the men about expecting and caring for babies seemed a bit off - I found myself thinking that there is no way a few men hanging out in a bar would be discussing nursery decorations, expectations for when the baby arrives, and pregnancy. Overall, this was an okay read for me. I would recommend it to someone looking for a light, romantic read. The town has lost money to a smooth conman investor, winter is approaching, and Maggie is pregnant and planning to spend her first winter in the snowy mountains. Whether Jameso (the father to be) is as excited about the pregnancy as Maggie is, is an open question. The town come up with ay to raise money, and maybe get their lost investment back. A fun light read on a snowy weekend...but too predictable and a lot of "reminder" filler to refresh readers of the first book for my liking. Nothing really to sink your teeth into. I will read the third one but only because i already have it and doubtful i will continue the series. If you need something light hearted and fun but predictable .... go for it. This wont be one i keep in my literal shelves or reread. I will however pass it on to others who may enjoy it. The author does a great job of bringing to life the tiny town of Eureka and the individuality of the lifestyle there. Life in small western towns lends itself to a deeper sense of community and resourcefulness that reminds us of days gone by and Cindy Myers captures this in the pages of this sequel. The characters are believable and she manages to weave them together with a little humor, a little suspense, a little romance and a lot of real life. I gave this book 3 chapters. It was well-reviewed in a couple journals, so I checked it out as a fun holiday read. Unfortunately, I couldn't identify with any of the leading ladies as they were all 20+ years older than me. Clearly I wasn't the intended audience for this book, and without a tie to the characters I couldn't justify spending any more time on it - so I quit after 3 chapters. If you're a 40 year old divorcee and/or single mom who likes contemporary romance - you might like it. What a lovely story. A beautifully set story with a quirky small town. The characters were so multi-faceted as to seem like old friends. Times are tough but the people are tougher! I so enjoyed this glimpse of American resilience. It was a gentle read, but a heart-warming one, evenly paced and beautifully written. Eureka is small town USA, nestled in the mountains of Colorado. Abandoned gold mines that were once prosperous don't help this small towns economy. But the residence are one big family and they love their snow and their community holiday celebrations. They also help love blossom. Wonderful Christmas spirit and traditions. Enjoy this one. A lovely little story about a community in a small town in Colorado. The story is a warm and sweet experience of how a community pulls together. It made me wish I could get snowed in somewhere with wonderful friends and family. Ahh, Fiction! No, truly. It is a good story and made for a lovely read cozy under the covers. Trying to neaten up post-holidays, I found my copy and realized I hadn't reviewed it. Bad me! Great book - I loved revisiting the town of Eureka and learning more about the lives of the ordinary, extraordinary people who live there. Comfort food for the heart. This one continues off in Eureka with the same great people we met in the first one. Very good and already diving into book three. These are just that great comfort read and feels like everybody would fit in this little town Eureka. This is my idea of a perfect escape book. The setting was easy to imagine and the people felt like old friends. Such a sweet, hopeful story. Couldn't put it down after I started reading. a good story about people trying for the best of life. 3.5 for this one. It wasn't amazing, but it was a good story with a good plot twist that I didn't begin to suspect until halfway through the book. Took a bit to get into this book...but it picked up a third of the way thru. If it hadn't been a continuation of a story I really liked I would have quit and I'm glad I didn't. I couldn't finish this book. It was just too poorly written. I couldn't get over the bad dialogue. It was a neat idea for a story. I just feel like this writer needs to really work on her prose. I am currently reading this book and am only on Chapter 1. I believe from where I am currently I will most likely enjoy this book. Actually just your typical romance story but I enjoyed as there were several plots. I would love to find a little town like this to live in.